Writer and director David Ayer has shared the first look of a heavily tattooed Shia LeBeouf, who’s set to star in Ayer’s upcoming gritty crime thriller Tax Collector. Tax Collector was announced back in June, and while details about the plot and characters have remained under wraps, it has been reported that Ayer is writing, directing, and producing the film, with LeBeouf and Bobby Soto attached to star. The film is expected to film primarily in Los Angeles this summer. It will be based on a script written by Chris Long, who’s known for his work on Mr. Mercedes, with George Lopez and Once Upon a Time‘s Lana Parilla joining the cast. 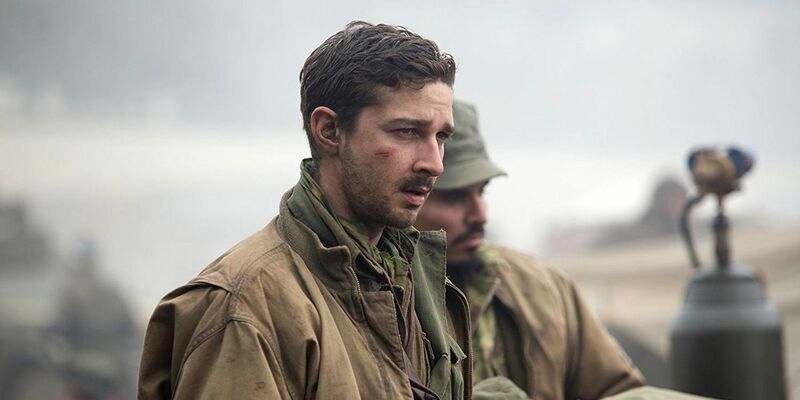 While there hasn’t been any official word on when the movie will start shooting, it appears it’s either far into pre-production or already into production as there is now a first look at LaBeouf’s character in the movie. LeBeouf’s exact role in the film is unknown, but Ayer took to Twitter last night to post a photo of the star in full makeup (below) – and the actor is almost unrecognizable. Sporting a buzz cut, smoking a cigarette, and wearing nothing but sunglasses, shorts, and boots, LeBeouf is almost completely covered in tattoos. While some are hard to make out, the most noticeable are the ones covering his torso. There is what appears to be a woman with someone else in what is possibly clown makeup with the word “creeper” spelled out below them. There are also a pair of cartoon gloved hands pointing at each other below that, and the entire piece is decorated with art such as flowers and peacock feathers. LeBeouf also has a highway sign on his left shoulder that reads “Route 071”, and what looks like drawings of people on his legs just above the knees. He has tattoos on his fingers as well that read “071 Crew”, which is likely connected to the “Route 071” shoulder tattoo, and what looks like the word “Battlefield”. To top it all off, the actor is also wearing several necklaces, with one of them possibly being a dog tag of some kind. What’s interesting is that this first look heavily resembles the first look DC fans got for Jared Leto’s Joker three years ago for Ayer’s Suicide Squad. But what it proves is that the filmmaker is going back to its gritty roots with his new movie. LeBeouf has been going through a kind of transformation these past few years. Leaving his Disney and Transformers fame behind, he’s become known for his often bizarre and intriguing performance art. He’s also been taking on roles in smaller and more independent films such as Borg vs McEnroe, American Honey, and Man Down. Besides Tax Collector, his upcoming projects include Honey Boy, about a child actor working to mend the relationship between him and his father, and The Peanut Butter Falcon, an adventure story about a young man with Down syndrome who runs away to become a professional wrestler. Tax Collector will be the second collaboration for LeBeouf and Ayer; their first being 2014’s Fury. In fact, the two tried working together again almost immediately after Fury released, with LaBeouf meeting with WB for the part of GQ in Suicide Squad, though the studio wasn’t interesting in casting the star in that movie. That particular role ended up going to Scott Eastwood. As for Tax Collector, the film still doesn’t have a scheduled release date, but the photo of LeBeouf should be a sign that production is starting to get underway, so audiences shouldn’t have to wait too long for more concrete news on the project.